So here’s what’s happening. I had that terrible reaction to Cromolyn, but it continued for a few more nights than I would have expected. I’ve never felt so sick and urgently needed to change everything in case something — anything — was contributing to this downfall. I was suddenly willing to take no meds or supplements, eat nothing, go bankrupt, leave the dogs, do anything to survive. I don’t know how to explain it. It didn’t feel like typical ME payback. It wasn’t my blood pressure or blood sugar or temperature, it wasn’t pain, it wasn’t my muscles… it was a feeling of system-wide poisoning. I realised it started the day after we got back from the coast (a dream come true, which I will blog about at another time), so I had to get out of my home, too, in case it was the cause. I wasn’t willing to stay one more night and risk being in the midst of whatever was poisoning me. It was that bad. It took me about one minute to make the decision. For two reasons: 1. If the house or the dogs were somehow making me sick, I had to leave immediately. 2. At the very least, I’m allergic to the dogs and getting away from them would help me heal and have one less assault on my immune system. Plus, Husband and I have talked about my staying somewhere else ad nauseum and always thought the first test would be in Seattle somewhere, it was just something that we hadn’t had the gumption to tackle yet. My friend Erik, who has recovered through extreme mold avoidance, bullied encouraged me to not bring anything from my home — not my clothes, not a toothbrush, credit card, phone — in case mycotoxins were contributing/causing my illness and/or relapse. After arguing why I needed my own pillow, my sleep apnea oral appliance, my special food etc., I realised… No I don’t. My urine mycotoxin tests were high out of range. Eliminate all possible variables. Take nothing. Once I wrapped my head around it, it seemed like an obvious leap. I was leaving anyway, so why not go whole hog? I found an AirBnB rental nearby that was able to have me check in last night. It’s not cheap, but it’s cheaper than a hotel and incredibly nice. It’s a brand new studio on top of a garage. New enough that I’m risking using their washer and dryer, but not so new that I’m overly concerned with all the Ikea cabinetry and new sofa and bed. It’s only available until Thursday, but it buys me some time to gain some strength and figure out what to do. Husband, the selfless angel supporter, bought me a super-cheap tablet, so I could have email access, food, a few toiletries and a cheap outfit (leggings, sweatshirt). I stripped on the doorstep of the rental, left my clothes in a bag there and went straight in and showered. I have an emergency kit outside the door: epipens, benadryl, inhaler, blood sugar tester, glucose tabs, my phone and thyroid hormones. Last night was rough. The sheets here are washed in smelly detergent which makes me sneeze and keeps me up at night (I know normal people don’t believe this, but, yes, the smell wakes me up over and over and makes me feel like I’m choking), so I’m going to wash the sheets and duvet cover today. Their pillows are for giants — prop your head at a 90 degree angle — so, I went pillowless and my neck is killing me today. I couldn’t get to sleep until after 2am and then I woke up constantly, of course — I have no cpap, no mouth guard for grinding, no ear plugs, no eye shades, no melatonin, no magnesium, no dogs — but it was better than it has been. Thank you so much for your generosity and support, family. I’m so grateful to not have had to run to the streets or, worse, had no option to leave and no husband to help. I’m not sure what my next step is. Go from rental to rental until I know whether I can return to the house? Or sell everything and get out? I don’t know. I’m scared to test anything right now. The reactions/symptoms I was having were too deadly. Love you all so much. Especially you, dear husband. You give so much every day. I am so sorry this is ruining your life and dreams as well as mine. We have had such a rough time, but I will fight for us and our little family with everything I have. Every ounce of energy and every penny. I’m not doing well. I spent all of yesterday on my feet and moving, which is crazy, obviously, but I’ve been so much stronger recently and I don’t have my typical payback muscle pain, so I’m not recognising the warning. Last night was horrific. Drenching sweats, heart palpitations, hard to breathe, shaking, feverish without the fever, terrible head, this is all stuff I haven’t felt since the first year and a half I was sick. I’m worried that it is viruses rearing up, like Dr. Chia describes, and a catastrophic (what if permanent??) crash and I didn’t heed the warnings and stay still because I didn’t have my typical crippling pain and stiffness. I’m worried that I brought this on myself because I got cocky and stopped my preemptive rests. I’m worried that I just made myself much worse with so much activity. Yesterday, I had a major breakdown. I’m horrified that I may have made myself much, much worse by not getting in bed and staying there, not moving. But I can’t tell you the level of hardship this puts on Husband — and myself! To shoulder the guilt and to have no sense of control over your life. Preparing my own food and taking care of myself may be making me worse right now, but it helps me feel less like a burden. But I’m very, very scared that this is simply ME and, in trying to help myself, I’m walking right into a much more disabled state. I’ve been averaging about 3 to 4 hours sleep every night this week. Today I need to figure out where I’m going tomorrow. Now that I’ve started this, I can’t go home yet. I’m far, far too sick to be anywhere that isn’t pristine, pet-less, easy to maneuver around… My system (immune, nervous, lymphatic, methylation) is too precarious to detox any assaults. Husband had to remove the scented garbage bags from the rental yesterday. Worst of all — honestly, it feels worse than anything — is the sudden removal from my dogs’ lives. I can’t even type that without crying. They are my guardians and have become so sensitised to my every breath, noise and movement. The codependence isn’t too healthy, but they’ve kept me company and kept me sane all these years. At least with human children, you can try explaining. I just keep imagining their confusion, knowing they run into my room every morning to cuddle. We have a routine. They will be neglected because husband and I are tapped out and that, more than anything , breaks my heart. My current rental didn’t work out (literally have slept an hour or two here and there for the last three nights) because it is so loud. The entire room shakes when vans/lorries/trucks go by and the person next door gets up at 4am and stomps around in what sounds like tap shoes on wooden floors next to the head of my bed. So, Z is coming from Vashon this morning to move me. I know I need to rest more than anything. Trying to listen to my body is very difficult recently. The return of acute immune system-shifting symptoms has been terrifying and horrifically hard on my body. You’re all correct — I did too much that first day and made myself worse. But that wasn’t because I was isolated and alone or being heedless — I’ve truly been able to do all those things the past few months. I’ve been strong! So, I just misjudged the sudden drop off in my abilities and, like I said, didn’t have my typical warning signs to stop. It was a bad mistake. And so was working 50-hour weeks for 6.5 months after I got sick. And so was joining an exercise class and taking massive amounts of vitamin B12 all the other ridiculous things I’ve done that have made me worse over the years. It’s very hard to rest if you’re not physically maimed. Really. It goes against everything in my nature and I will always fail at it, it seems. I think the hard part came when I spiralled further down after that first day and husband had to leave work to help me. And that was a double-blow because it came on the heals of his taking a week off of work for the coast trip. But, I’d never been in such a poor state. I may regret that he had to abandon a few days of work and we’re losing so much money (I already do! ), but who cares about jobs and money when you’re writing an “if I die” email? Only hour-to-hour survival has been on my mind this week. There are no words to describe the gratitude I feel that I have a family who cares, that there are people worrying about me and wanting to help. I never, ever take that for granted for a minute. I lost a lot of people the last few years and many people deal with this illness with nobody on their side, so I know how lucky I am that you care and want to help. So, thank you, THANK YOU for your thoughtful responses, empathy and for wanting to keep me safe. That, more than anything, is my overwhelming emotion: thankfulness that I’m not alone in this fight. My current rental has mold in the washing machine, in the evenings the whole place smells like secondhand cigarette smoke from the landlords next door (I literally got wheezy — imagine all those years of working in the smokiest of smokey bars!) and the blankets on the bed smell so bad that I asked if I could get them laundered and the man said he had never had them washed before!! This all made me want to get the hell out, so I felt like I needed to give up and go home … I’m so tired… And Husband actually persuaded me to stay away (here or somewhere else). He wants more time to de-dog-ify the upstairs of our house, move out the furniture, bring the carpet to the cleaners etc. He thinks I should give this experiment a longer trial… I’d like to stay away until my night sickness and sweats totally abate because they are such an indicator of how bad I’m doing and then see how I do at home. This new rental is great besides the moldy washing machine (again), but, interestingly, I have a stuffy nose and the electric shivers in my leg came back the first day here — both for the first time since leaving home 10 days ago. Also, I have a new and different drugged feeling here and joint pain has not eased up. But, I’m still planning to stay a week and the good news is my sweats/shivers/shakes stopped (!!!) after 12 harrowing nights and I got some relief from the complete bowel freeze of the last week. I reintroduced a few things from my house (food, apnea device, supplements) with no adverse effects. Actually, the malarial nights went away 2 days after starting to wear my apnea device again, but they also started while I was wearing it, so there is no correlation. Yesterday morning, my ND sent out an intern to do a house call to take blood and do a hydrotherapy “constitutional” in my own bed. I don’t care what you think about naturopaths, there are no MDs making free house calls and spending an hour, so I want to win the lotto and pour money into this clinic. My testosterone, estrogens, DHEA, TSH, free T3 and free T4 are all out of range low. Sometimes I honestly think this whole illness is caused by my thyroid being dead. Grave’s disease is evil and most people who have gone through radioiodine ablation are on MUCH higher doses of hormones. Ah, 6th rental is a charm. I kind of want to live here. The only downside is the bed is rock hard. I am so boney, have no muscle and have to deal with the fibromyalgia pain, so I really need plush bedding to not wake up in terrible pain. I’m force feeding myself. I get up, cook, eat, rest, cook, eat, rest, cook, eat, TV, sleep. The first morning here, I woke up without a headache for the first time in a week, which confirms to me that something in the other rental was affecting me (and it started before I reintroduced Coconut Bliss ice cream and chocolate, so, thankfully, I have no good reason to continue to deprive myself of my sugar addiction ;)). I still have an achy headache, but it feels like it’s from a stiff neck and TMJ issues as opposed to a reaction to something. I increased my thyroid hormone and started a few supplements and low-dose Zyrtec. Feeling more stable. 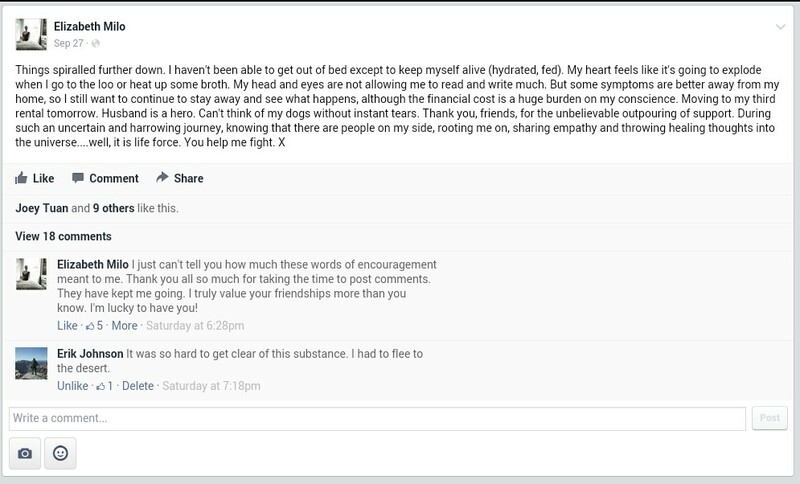 This entry was posted in CFS/ME, My story and tagged allergies, crash, dogs, fever, ME, mold, myalgic encephalomyelitis, night sweats, relapse, shakes. wow, elizabeth. I hope you continue on this upswing. I mean, I know it’s very modest and you’re suffering a lot, but I hope it improves more and more. Though there are some real differences, the way you described your crash here is very similar to ones I have–and have had recently. You mentioned a couple of things very much on my mind lately as well. The idea of avoidance (though I have no idea how I’d swing that), and also the idea that I can be as safe as I can do, and all it takes is one load of mildewy clothes to destroy that. I really appreciate your writing. I wish to hell you didn’t have to go through any of this, but it is good because you make me (and others) not feel quite so alone and freakish in the aspects of this illness. I hate that you have gone through similar crashes, Michael. This scared the bejesus out of me. I really appreciate your saying that my writing makes you feel less alone (and freakish is totally true). I kept up this blog to keep my family informed in one place without separate emails, but I sometimes wonder if the public gets anything from it. I’ve made friends, though, and that was unexpected and wonderful. I wanted to add, in case it’s a concern for you….I had high mycotoxin tests as well (all 3 higher than yours), and I did a charcoal detox for about 5 months and brought them down about 1/2. Didn’t feel dramatic improvement or anything, but I think it might have helped the levels. I’m so glad you mentioned this!!! Ok, so charcoal every night? Once a week? Did you have a preferred brand? What dosage? I was taking charcoal once a week, but think I will increase it. Really feel for you. I have been there (and have not won the battle yet). All the symptoms you mentioned add up, in my personal experience, to histamine and salicylate intolerance. There may be something you are eating that is very high in histamine and/or salicylates. Going on a strict low histamine and salicylate (and ideally medium to low oxalate) diet is one way to test it. Try an anti-histamine as well (some will work better than others…Loratidine may help). Lowering your FODMAP intake to reduce bacterial/yeast toxin production can also help. Healing your gut (from possible SIBO, gut dysbiosis, leaky gut) is the most important (and extremely difficult) thing you can do. In the short term an elimination diet can make life bearable. Thanks for the comment, J. I’ve been on elimination diets for 2.5 years and have been eating varying levels of low-histamine for 15 years. I promise you, what is happening to my body with ME goes way beyond what food does to me. It is much, much more severe and I’ve been in full-blown anaphylaxis many times. But, I’m still experimenting with food, so I appreciate your advice. Thanks for your reply Elizabeth. I neglected to mention that I also have Lyme and other tick-borne infections (formerly diagnosed as ME) so I fully appreciate that your symptoms do not stem from food and gut health issues alone and cannot be resolved solely by elimination diets or healing the gut. Having had a look at your lovely Instagram photos it looks like you are eating some high salicylate and high histamine/amine rich foods (broth – amine content; beef – as it is usually hung for a couple of weeks). Everyone is different of course (and the lists are not necessarily accurate) but it may be worth trying the FailSafe elimination diet for a couple of weeks (with all salicylate containing toiletries and toothpastes and any higher histamine foods removed). http://www.failsafediet.com/the-rpah-elimination-diet-failsafe/salicylate-content-of-foods/ Horribly restrictive I know. It is obviously not a long term solution, and nutrition has to come first, but it may be worth a try in case it can give you some relief in the short term. In my experience my severe intolerances (to many foods, salicylates in toiletries, smoke, heat, everything and anything!) exacerbated my symptoms tenfold. Reducing my histamine and salicylate load brought me back from an unbearable nadir. I firmly believe that fixing one’s gut health issues is a crucial piece in the recovery puzzle and that mast cell activation will continue if one has an underlying infection. It is a long road but we will get there! All the luck in the world to you! One thing I forgot to mention…taking a supplement break is important, often supplements (and the fillers) can be triggers. Thank you, Maureen! It means a lot. I’ve been breathless, reading everything you’re going through. It’s so hard to imagine everything that’s happening. My daughter has ME and it’s getting worse. We both don’t know how she is continuing going to work. She has to take time off during the week. 😦 Hoping that something you will hit on, will be the thing that will start you to feeling some relief. What a horrible experience. When my Multiple Chemical Sensitivity was diagnosed my parents rented me a house on the coast for two weeks. It was like the light breaking through storm clouds. I hope you can resolve your living dilemma and continue to get over this sudden crash. Claire, what a gift. I can imagine the relief of having your family find you a sanctuary. Thanks for commenting!